New York (TADIAS) Last year, Mayor Michael Bloomberg launched the NYC Venture Fellows program, designed to connect promising entrepreneurs from around the world with mentors and investors from leading companies. The fellowship encourages national and international start-ups to locate and grow their businesses in New York City. The class of 2012 includes Bethlehem Tilahun Alemu, the Founder & Managing Director of SoleRebels — a fair trade certified green footwear company based in Ethiopia. 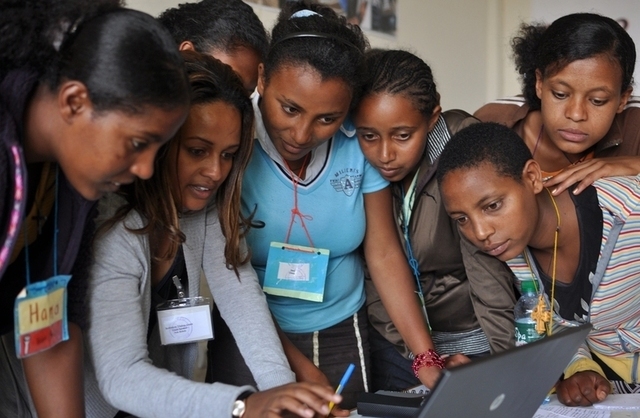 Bethlehem, who was born and raised in one of Addis Ababa’s most impoverished neighborhoods (Zenabwok, Total area), established SoleRebels in 2005 hoping to increase employment in her community. SoleRebels has not only created hundreds of local jobs, but it has since become an internationally recognized eco-fashion brand. Bethlehem estimates the retail roll-out will generate over $10 million in revenue by 2016. “We feel strongly that people all over the planet want comfy, stylish and unique value priced footwear” she said. SoleRebels shoes are made by hand using indigenous practices such as hand-spun organic cotton and artisan hand-loomed fabric. Tires are also recycled and used for soles. “The process is zero carbon production because historically that is the way it’s been done in Ethiopia,” she said. Bethlehem has garnered international recognition, and earlier this year was also named one of the World Economic Forum’s Young Global Leaders. In that role Bethlehem has been tasked to launch a program in Ethiopia called Global Shapers as a key initiative to create opportunities for the youth. With Addis Ababa preparing to host the 2012 World Economic Forum Africa meeting, the Global Shapers community will be able to collaborate with the Forum of Young Global Leaders while operating out of more than 75 city hubs – from New York to Mexico City, Johannesburg to New Delhi, and Addis Ababa to Adelaide. “I have created a strategy to build our Global Shapers community by selecting my group based on input through outreach conducted via social media,” she said. “Under the title ‘Come Change Your World’ I am inviting individuals to express why they, or someone they know in the greater Addis Ababa area, should be chosen as a Global Shaper.” The process of outreach and selection includes gathering real-time input, insights and feedback. Global Shapers can jumpstart their entrepreneurial careers by interacting with Young Global Leaders, social entrepreneurs, technology pioneers, foundations members, global agenda councils and more. Bethlehem is also selecting one Global Shaper to address the upcoming annual World Economic Forum in Davos, Switzerland. Amazing story. It is such an important service to take care of Ethiopian youth. They are part of a countrys future. Bethlehem is an example that Ethiopia’s best days are still ahead of us. She represents the many non-nonsense new generations of Ethiopians across the globe that we are witnessing today. A trail blazer indeed!!! Congratulations! Wonderful! I liked the idea. I like Bethlehem even better. I’d buy these shoes just to be able to talk about them with others. It is very interesting, here worn out tires are either burnt or thrown away. It is a nice venture. We want to invite Bethlehem Tilahun Alem at our International Trade Fair to take place from 1-10 July 2012 in Dar es Salaam Tanzania. During the fair she will have a chance to discuss with women groups of who are involved in small projects.